So I was sitting in my dentist’s waiting room, just paging through the latest Sports illustrated, and I came across this photo of The Masters. At first I started side-eyeing it since it felt kind of weird and HDR to me. But then I realized it was infrared instead and, while it still felt off to me, it also got a lot more interesting. Since Kukkurovaca kind of fanboys about infrared but isn’t looking at anything sports-related, I flagged these with him on Twitter and we had a decent conversation about them while I was waiting to get my teeth drilled. I’m not going to transcribe our conversation. But the basic premise involved discussing whether these felt off because they’re not the best infrared images* or because of the more interesting phenomenon that occurs when the content of an image does not match what we expect to find from the form of the image. *There’s some weird contrast going on in many of them where parts feel way too high contrast HDR-like and other parts are still muddy. There’s also a lot of noise which suggests either ISO pushing or an unmodified digital camera where the hot mirror is causing the noise. It was easy for me to file my initial reaction to these as a combination of “Ack, this isn’t the best IR I’ve seen.” or “Cool, I’ve not seen sports photography that looks like this.” But I had to step back and realize that neither of those was my actual first reaction. I didn’t recognize these as IR despite the glowing Wood Effect in the foliage. And that’s because infrared just doesn’t look like this usually. My eyes expect infrared to be slow film landscapes or people caught from a “hidden” flash. And while infrared digital has much higher ISOs than film does, the digital work I’ve seen has been of the same look as the film work—which makes sense since moving to shooting digital IR is typically done because of a desire to emulate IR film. I’m not used to seeing moving objects—let alone athletes and golf balls—get frozen. I love that I misdiagnosed these though. Despite not liking the photos, I really like the idea of them. That we have the technical tools to apply a way of looking to situations where our eyes are not used to seeing that way is great. Any time our learned perspectives can be questioned and broken and our eyes trained to see more broadly is a wonderful experience. One of the constant discussions in photography has been about the issues of surveillance and voyeurism and the appropriateness of observing and recording the lives of other people. Much of this discussion is as much about the identity of whoever’s doing the recording as much as it’s about the actual act itself. Some people get upset by government surveillance while others find individual photographers more threatening. I’ve seen numerous projects over the years which push the issues with regard to individual photographers. Hidden cameras, infrared flash and film, telephoto lenses, anything really that allows you to take pictures of people in situations they wouldn’t want to be observed in. At their best, these kinds of photos make me think about the nature of photography and my practice of it. At their worst they end up being creepy and creepshotty. But the experience is always as much about the individual photographer and his technique in capturing people candidly as it is about the subjects themselves. Looking at the photos makes it easy to put ourselves in the photographer’s shoes; we see what he sees and our enjoyment of, or reaction to, the image often aligns itself with his intent. Trevor Paglen though is one of the few photographers who addresses the other side of the discussion. Paglen investigates the pervasive surveillance by the state and its effect on all of us as subjects, or possible subjects, of that surveillance. * His show at the Altman Siegel gallery is small** but extremely thought-provoking in this regard. *His Last Pictures project is sort of related in that it covers the infrastructure of surveillance but is a much different provocation in that it asks questions about what kinds of images and things humans will leave behind after our extinction. **You can see everything in the show on the website. It’s especially interesting in that rather than being angry or outraged, Paglen’s work is very quiet and contemplative. It’s easy to be upset about rights abuses and blame politicians for prioritizing immediate comfort over principles. It’s quite another thing to really think about the nature of how much we, as a society, have invested in watching ourselves and what it means to have that subtext lurking underneath everything. The photos are pretty in a minimal, natural, elegant way. Which is exactly the point. Just underneath the quiet scene is a ton of infrastructure dedicated to watching and monitoring and controlling us. All of us. A few images are paired with maps that feature a lot more information* about the location and the nature of the infrastructure there. This information demonstrates the magnitude of the surveillance while also giving it a material presence. As clean and elegant as the photos may be, the maps show the messiness we’re not supposed to know about. They work really well together as diptychs and really increase the sense of wrongness and unease that I get when just looking at the photos. *Much of which comes from the Edward Snowden disclosures. Paglen’s photos are also especially noteworthy here because they’re photographs where the actual subject of the image isn’t just hidden but is actually incomprehensible without any of the provided context. This isn’t merely hard to do with photography, it’s not how photography is supposed to work at all. Yet Paglen manages to not only make it work but turns all the potential problems into features. How do you take photos of hidden infrastructure? Don’t show it at all and instead imply that it could be anywhere and everywhere. Rather than showing what we think of when we think about surveillance—cities and security cameras and other places where physical crimes may be expected to occur—these quiet scenes tell us that we can’t get away from that eye. And that it’s not being watched physically that’s the really creepy part of the surveillance state. What’s creepy is the sense that the surveillance is everywhere and watching everything. What’s creepy is that we’ve all bought into the system that supports this. What’s creepy is realizing that as much as this upsets me, there’s part of me that’s glad it’s there. 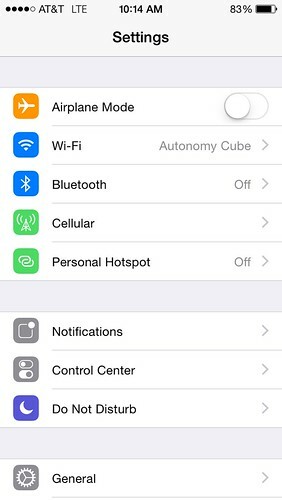 Which makes it nice that Autonomy Cube is also in the gallery. It’s always fun to have some artwork that you can interact with. And while this isn’t a major bit of interaction—just connecting to a Wireless Access Point which routes everything through Tor—it’s enough make me start to think about the alternatives. The idea that it’s part of an ostensibly private/anonymous internet is comforting. At the same time I also felt myself questioning whether or not I could trust it. Or whether anonymity is even all it’s cracked up to be. As much as I may not trust the government, it is the devil that I know. Anonymousland meanwhile is unknowable. And the internet so far has not been particular good about demonstrating that anonymous cowards are any better. Plus there’s the whole question about the wisdom of changing your behavior because you can’t trust the government to act responsibly. * I totally understand wanting to protect yourself. But this is also the first step toward victim blaming. The scale and scope of surveillance should prompt us to think about reining it in or providing proper guidelines about its application, not how each of us should protect ourselves better on an individual basis. *A point Snowden himself makes at the end of this video.